I’ll be updating this term glossary with relevant terms in alphabetical order and their kanji where appropriate. If I used a term you can’t remember the meaning of, check back here to look it up. It’s also a good place to go if you want more information on a specific topic, since you can use what you find here to do some research of your own. I recommend using your browser’s search function (default Ctrl+F) to locate specific terms, since this list will probably get pretty big. Note to those interested: All Japanese terms are presented in the standard Hepburn romanization. Chinese terms are provided in pinyin unless otherwise noted. Since Chinese history is rather closely intertwined with Japanese history, it’s important to be able to correctly pronounce the names of various important Chinese figures. I’ll be using the pinyin romanization system for any transliterated Chinese (with the exceptions of names better known by their variant spellings, such as Chiang Kai-shek or Sun Yat-sen), and you can find a guide to pronouncing pinyin here. Asuka Period (飛鳥時代): A period of Japanese history running from 538 to 710 AD. Characterized by the rise and centralization of the Yamato kingdom under the ancestors of the modern Japanese ancestors, as well as the arrival of Chinese culture and Buddhism. Azuchi-Momoyama Period (安土・桃山時代): A period of Japanese history running from 1573 to 1603 AD. During this period, the warlords Oda Nobunaga, Toyotomi Hideyoshi, and Tokugawa Ieyasu put an end to over a century of fighting; Ieyasu eventually established himself as shogun. Bakufu (幕府): A term used for governments dominated by warriors. The government of a specific family of shōguns was described using the appropriate era or family name (e.g. the government of the Tokugawa family is referred to either as the Edo bakufu or the Tokugawa bakufu). The term literally means “tent government,” a reference to the tents a marching army of samurai took on campaign. Bakumatsu (幕末): A term meaning literally “the end of the bakufu.” It generally refers to the final years of the Edo Period, between the arrival of Perry in Edo Bay (1853) and the final collapse of the Tokugawa bakufu (1868). Boshin War (戊辰の乱): The 1868 war against the Tokugawa bakufu launched by the proponents of Imperial restoration. The term “boshin” means “wooden dragon;” according to the traditional Chinese zodiac cycle, the war began in the year of the wooden dragon. Buke (武家): “Warrior Family.” The term buke refers to any family of samurai status. Buke first appeared during the Heian Period, and came to dominate Japan from 1185 to 1868 AD. 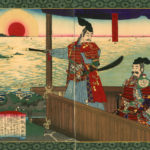 Daimyō(大名): A daimyō (lit. “great name”) was master of a specific han(藩) or fiefdom. Daimyō were members of the samurai class who maintained large numbers of samurai vassals. They were subordinate to the shōgun. After the Meiji Restoration, daimyō lost their hereditary land claims, and instead formed the basis of a modern peerage based on the British system. Edo Period (江戸時代): A period of Japanese history running from 1603 to 1868 AD during which Japan was ruled by Tokugawa Ieyasu and his descendants. Fudai (譜代): A term for families of daimyō in Edo period-Japan whose ancestors supported Tokugawa Ieyasu prior to his rise to power. These families were awarded prime domains after his victories, and control of the highest ranking positions in the Tokugawa bakufu was limited to them. Fujiwara Clan (藤原氏): A politically powerful clan descended from Fujiwara no Kamatari, a noble instrumental in the overthrow of the Soga clan. The Fujiwara developed immense political power, and dominated Japanese politics during the late Asuka, Nara and Heian periods (645-1185 AD). Their influence was eventually destroyed by the rise of the samurai class. Gempei War (源平の乱): A war between the Minamoto and Taira families of buke (warriors). The war saw the final vestiges of aristocratic and imperial power destroyed, as the triumphant Minamoto held unchallenged control over the entirety of Japan. Imperial rule would not be restored until 1868, amost 700 years later. Han Dynasty (漢朝, Japanese Kan-chō, Chinese Hàn cháo): A Chinese dynasty which reigned from 206 BC to 220 AD. The first recorded written record of Japan dates from the Han Dynasty, and was written in 54 AD. Heian Period (平安時代): A period of Japanese history running from 794 to 1185 AD. So named for the city of Heian, which was the capitol of Japan during this period. Heisei Period (平成時代): A period of Japanese history running from 1989 AD to the present day, corresponding to the reign of Emperor Heisei (personal name Akihito). It has been characterized by a weakened post-bubble economy, political instability and recurring social problems. Hōjōki (方丈記): A zuihitsu-style collection of musings compiled in the early 1200s by the monk Kamo no Chōmei. It concerns itself primarily with describing various calamities which occured in the city of Kyoto during the Chōmei’s lifetime, most notably the Hōgen and Heiji Rebellions and the Gempei War. A translation is available here. Ikkō Ikki (一向一揆): An upprising (ikki) of the Ikkō sect of True Pure Land Buddhism. During the chaos of the 15th and 16th century, the Ikkō Ikki organized itself as a military force promoting an extreme and radically egalatarian variant of True Pure Land Buddhism. Though initially extremely successful and able to establish itself in central Japan, the Ikkō Ikki was eventually brutally crushed by Oda Nobunaga during his rise to power. Imperial Japanese Army (大日本帝国陸軍 Dai-Nihon Teikoku Rikugun, occasionally 皇軍 or kōgun, “the Emperor’s Army,” usually abbreviated IJA in English): The ground arm of the Japanese military from 1872 until the demilitarization of Japan during the American Occupation in 1945. The Imperial Army was formed originally from units donated by the victorious domains of Satsuma and Chōshū, the army was later supplemented by the imposition of national conscription. Later, internal military struggles and a lack of official controls over the military would result in the seizure of power by the army and navy in the 1930s and Japan’s spiral into militarism. Imperial Japanese Navy (大日本帝国海軍, Dai-Nihon Teikoku Kaigun): The naval branch of the Japanese military from 1872 until 1945. The navy was formed out of the combination of the old domain navies and the remnants of the bakufu navy. Like the army, it became increasingly involved in politics in the 1920s, culminating in the rise of military government in the 1930s. Japan Socialist Party (日本社会党, Nihon Shakaitō): Founded in 1945 out of the remnants of prewar Socialist groups, the JSP expanded rapidly during the Occupation and the years immediately following. However, due to a combination of American pressure against Leftism and the successful checking of the group’s momentum by the LDP, the Socialists were unable to gain a majority in the Diet, and were relegated to the status of an opposition party for almost fifty years. A Socialist coalition was able to take control of the government in 1993, but infighting and political compromises caused it to collapse in 1995, with the party itself splintering apart a year later. 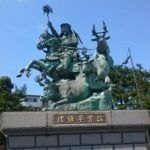 Emperor Jimmu (神武天皇): The legendary first Emperor of Japan, grandson of the sun goddess Amaterasu. The modern Japanese emperors are, according to mythology, direct descendants of this emperor. Supposedly, he was proclaimed emperor on February 11, 660 BC and died in 585 BC. Kamakura Period (鎌倉時代): A period of Japanese history running from 1185 to 1336 AD. During this period Japan was ruled by the Hōjō family from the city of Kamakura (south of modern Tokyo). Kampaku (関白): In theory, a person holding the title of Kampaku during the Heian Period acted as a sort of chief advisor to the emperor/empress. In fact, Kampaku from the Fujiwara family used it as a defacto regency, governing the country in the name of an adult emperor. The title was stripped of much of its power after the rise of the Minamoto family, though courtiers in Kyoto continued to be appointed to it. It was formally abolished only in 1872. Kōdōha (皇道派): The “Imperial Way Faction” of the post-Russo-Japanese War army. The Kōdōha advocated for the cultivation of martial spirit and the mass indoctrination of the Japanese people as the only way for Japan to survive future wars. It was badly discredited by its failed coup attempt on February 26th, 1936, but was not totally destroyed — members of the Kōdōha retained influential positions in the Imperial Army until surrender in August, 1945. Kofun (Tumulus) Period (古墳時代): A period of Japanese history running from 300 AD to 538 AD. The name comes from the Kofun, large earthen burial mounds built during this period. It is during the Kofun period that the first Japanese emperors begin to appear. Kojiki (古事記): Compiled in 712 AD, the Kojiki is Japan’s earliest written collection of history and mythology. Much of our knowledge of history in the period of 500-700 AD, as well as our understanding of Japanese mythology, is derived from this documents and later histories based on it (particularly the Nihon Shoki and Shoku Nihongi). Kuge (公家): A term for the aristocratic families surrounding the Imperial Court. Kuge were not warriors, but were the descendants of Heian-period aristocrats. After 1185, they were stripped of political power. Liberal Democratic Party (Jiyūminshutō　自由民主党, usually abbreviated as Jimintō自民党 or as LDP in English): A conservative market liberal party established in 1955 out of a merger of the Liberal and Democratic parties. Originally formed to block the rising influence of the Japan Socialist Party, the LDP rose to the heights of power and would dominate Japanese politics in a series of unbroken victories until 1993. The current Prime Minister, Abe Shinzō, is a member of the LDP. Makura no Sōshi (枕草子): The Makura no Sōshi, or Pillow Book of Sei Shōnagon, is a zuihitsu-style work (a collection of random musings) written by the 11th century aristocrat Lady Sei Shōnagon. It is considered to be one of the definitive examples of the genre; a selection of translated entries is available here. Man’yōshū (万葉集): A collection of poetry dating from 711 AD. The Man’yōshū is the earliest collection of Japanese poetry, and is still widely read today. A slelection of 100 of the poems are available in Japanese, romaji, and English translation here. Meiji Period (明治時代): A period of Japanese history running from 1868 to 1912 AD during which Japan was ruled by Emperor Meiji (personal name Mutsuhito). The Meiji Period saw the rapid modernization of Japan, culminating in its acceptance as a world power after victory in the Russo-Japanese War of 1904-05. Muromachi Period (室町時代): A period of Japanese history running from 1336 to 1573 AD. During this period Japan was nominally ruled by the Ashikaga family, whose palace was located on Muromachi Avenue in Kyoto. However, after 1467 they lost control of the area outside of Kyoto and the country devolved into civil war. Nara Period (奈良時代): A period of Japanese history running from 710 to 794 AD. During this period the Emperors set their capital at Nara and began many of the reforms which lay the basis for the ritsuryō system. Nengō (年号): A dating system imported from China. The nengō system involves use of divination to determine an auspicious name and starting date for a new period/era; all year dates are then given from the starting date of that era (e.g. the first nengō era began in 645 AD and was called Taika [Great Change], so 645 AD was referred to as Taika 1, 646 as Taika 2, etc). When those same diviners decided an era name was no longer auspicious they would determine a new one and restart the count. The system remains in use today, but in an effort to simplify it the era name is now only changed upon coronation of a new emperor. The year 2013 is Heisei 25. Pure Land Buddhism (浄土宗, Jōdo-shū): A sect of Buddhism based on worship of the buddha Amitaba (Japanese Amida) and founded by the monk Hōnen. Worship is performed by ritual repitition of the nenbutsu, a chant praising Amida. Being theologically rather straightforward (particularly compared to the Zen sects) and containing a strong element of forgiveness for sins, Pure Land Buddhism developed a vast following in Japan and remains today one of the most popular religions in the country. Ritsuryō (律令): A code of administration and law, the early stages of which were developed by Shotoku-taishi under Soga patronage and later refined by the Emperor Tenji and his Fujiwara advisors. The ritsuryō system was consciously modeled on China’s legal and administrative system; its administrative structure involved a national bureaucracy (split between the Daijōkan, or Civil Affairs Bureau, and Jingikan — Religious Affairs Bureau) headed by a chief administrator (Daijō Daijin) who reported to the Emperor. The Emperor, in turn, appointed provincial governors on a rotating basis, recalling them to Kyoto when their term was up. After the rise of the samurai, the Ritsuryō system was marginalized, though it continued to function in the background. The Sengoku Period swept the last vestiges of it away, though Ritsuryō-style titles continued to be used until the Meiji Restoration. Rojū/Rochū (老中): This term literally means “council of elders,” and refers to two different things. The first council of Rojū was established by Toyotomi Hideyoshi to act as regents over Japan after his death until his son came of age. It lasted for about 2 years before Tokugawa Ieyasu’s rise to power destroyed it. The second institution referred to as “the Rojū” was the council of elders, composed of fudai daimyō, charged with advising the shōgun during the Tokugawa period. Samurai (侍): The term for an individual member of Japan’s professional warrior class. Also sometimes referred to in Japanese as bushi. Samurai dominated Japan’s government from 1185 to 1868, and descendants of samurai families continued to hold high office throughout Japan’s Imperial Period. Sankin Kōtai (参勤交代): A system set up by the bakufu to control daimyō during the Edo Period. Under this system, daimyō were required to reside in Edo for a fixed period, and subsidiary family members (children/spouse, etc.) to live there full time. This depleted daimyō treasuries by forcing them to expend money on trips to Edo and residences there, preventing them from funding military expansion in their domains. It also provided a pool of hostages to ensure good behavior. Sengoku Period (戦国時代): A period of Japanese history running from 1467 to 1603 AD. Sengoku literally means “warring states,” and during this period Japan was fractured into feuding domains which fought one another on and off. Sesshō (摂政): Regent to a child emperor or empress. The title remains in place today (though the modern constitution has removed all but its symbolic authority and it can only be held by members of the imperial family), but it was used to great effect by the Fujiwara family to dominate the Imperial Court during the Heian period. Shikken (執権): A regent to a shōgun. The title was used by the Hōjō family during the Kamakura period to solidify their control over the government; a series of Hōjō shikken acted as regents to inept figurehead shōguns. Shintō (神道): “The Way of the Gods,” Shintō is used as a catch-all term for the native animist religious practices of Japan. Prior to the 19th century it was a non-systematized religion which existed alongside Buddhism. The two were so closely aligned that Shintō shrines and Buddhist temples often shared grounds. They were forcibly divorced by the Meiji government as part of an (ultimately abandoned) project to establish Shintō as a modern state religion in the 1870s. This project was revived in the 1930s with the rise of Japanese militarism. However, the Allies divorced Shintō from the state in 1945. Shintō maintains an important role in the everyday life of Japan, but occupies a somewhat ambiguous role; some it is a cultural rather than religious practice, and others remain skeptical of Shintō involvement with the Imperial family (which is technically an organ of the state). Shōen(荘園): A privately-held, tax-exempt estate granted by the emperor to a person or institution (such as a Buddhist monestary) during the Heian Period. The relative independence of shōen allowed some powerful magnates to develop a financial base independent of the Heian government, contributing to the collapse of the Heian system. However, many shōen survived the rise of samurai government. They were eventually destroyed during the Sengoku period, as armed daimyo forcibly incorporated them into their estates. Shōgun (将軍): A shortened form of the title Sei’i-Taishōgun (征夷大将軍), a military title roughly translated as “Supreme General for Subduing Barbarians.” The title was first established in the 700s to indicate warriors charged with leading campaigns against the inhabitants of northern Japan (variously referred to as Ainu or Emishi, an ethnically distinct group from the Japanese). It was revived by the Minamoto family to give them legal command over the samurai class, and was used to that effect until the abolition of the title in 1868. Shōwa Period (昭和時代): A period of Japanese history running from 1926 to 1989 AD corresponding to the reign of Emperor Shōwa (known in America by his personal name Hirohito). The early Shōwa Period (1926-1945) saw the descent of Japan into militancy and belligerency, culminating in the Pacific War. The late Shōwa (1945-1989) was a period of post-war recovery, as Japan re-established itself as an economic powerhouse. Soga clan (蘇我氏): A family which dominated Japanese politics during most of the Asuka period, from the early 500s to 645 AD. The Soga clan utilized their continental contacts and patronage of artisans to build up a massive base of wealth, and introduced Buddhism as a way of undermining Shinto-affiliated rival clans. They were overthrown in the Taika Incident of 645 AD, and their influence was replaced by the Nakatomi (Fujiwara) family. Sonnō Jōi (尊皇攘夷): “Honor the Emperor, Expell the Barbarian.” Sonnō Jōi became the byword of a radical anti-bakufu movement of the early 1860s which advocated for restoration of Imperial rule and expulsion of foreigners from Japan. The movement failed after 1863, but many of its former members remained committed to Imperial restoration (if not expulsion of foreigners) and became the core leadership of the Meiji Restoration. Taika Rebellion (大化の変): A revolt in 645 AD against the Soga clan. The masterminds of the revolt were the aristocrat Nakatomi no Kamatari (who would be renamed Fujiwara no Kamatari and go on to found the immensely powerful Fujiwara clan) and the crown prince Naka no Oe, the future Emperor Tenji. The Taika Rebellion is also the date from which the nengō, or era name calendar system, was first used. Taishō Period (大正時代): A period of Japanese history running from 1912 to 1926 AD, corresponding with the reign of Emperor Taishō (personal name Yoshihito). The Taishō period is best known for the flourishing of party government (the so-called Taishō Democracy), when it seemed that political parties would play a serious role in governing the Japanese system. However, the parties lost their influence to militarists and central-planning bureaucrats during the Shōwa Period. 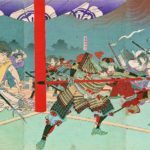 The Tale of Genji (源氏物語): A literary work, considered by some scholars to be the first novel in history, written by lady Murasaki Shikibu in the 1000s AD. The story chronicles the life of Prince Genji, son of an Emperor, in the city of Heian (Kyoto). It is widely considered an absolute classic, and is a must-read for those interested in Heian-era Japan. A downloadable English translation is available courtesy of the Oxford University Text Archive here. Tennō (天皇): The title of the Emperor (or Empress) of Japan. A gender neutral term first coined by the Empress Jito in the 7th century. Tōseiha (統制派): The “Control Faction” of the Imperial Army. The Tōseiha believed that a centrally-controlled, self-sufficient economic system was required for Japan to survive any major wars in its future. The Tōseiha would eventually overpower the rival Kōdōha after the latter’s failed coup in February, 1936 and come to dominate military policy. The most well-known member of the Tōseiha was Japan’s wartime Prime Minister, Tōjō Hideki. Tozama (外様): Literally “outer lords,” tozama daimyō were members of families who had submitted to Tokugawa Ieyasu only after his victory in 1600. Most tozama families had their domains reduced at the start of the Edo period, and were barred from high office in the bakufu. The power of tozama families could vary widely; though some were extremely poor and uninfluential, the second-richest domain in Japan actually belonged to a tozama family (the Maeda clan). The domains which eventually banded together to overthrow the Tokugawa (Satsuma, Chōshū, and the minor domains of Tosa and Saga) were all ruled by tozama lords. True Pure Land Buddhism (浄土真宗, Jōdo Shinshū): The most widely practiced sect of Buddhism in Japan, True Pure Land Buddhism is (as the name implies) an offshoot of Pure Land Buddhism founded by the monk Shinran. Like Pure Land Buddhism, True Pure Land Buddhism stresses prayer to the Buddha Amida (Amitaba in Sanskrit), who saves believers from damnation by bringing them to the Pure Land in the west where they can obtain enlightenment. The specific theological distinctions between the two are extremely complex. True Pure Land Buddhism also provided the initial impetus for the radically egalatarian militant movement known as the Ikkō Ikki, which established itself as an independent power during the Sengoku Period. Wa ( 倭): The first name ever given to Japan, used in early Chinese records describing the islands. The term is still used on occasion to refer to refer to a native Japanese concept or custom (e.g. washoku for Japanese cuisine). Wajinden (倭人伝)：The Records of the People of Wa, a 3rd century Chinese record describing life in Yayoi-period Japan. Yayoi Period（弥生時代): A period of Japanese history running from 300 BC to 300 AD. Our earliest written records of life in Japan date from this time period. Yayoi is a neighborhood of Tokyo; it was there that the first sites dating to this period were discovered. Zen (禅): A sect of Buddhism brought over from Japan in the late 12th/early 13th centuries AD. The two primary schools of Zen are Rinzai (臨在), Sōtō (曹洞), and Ōbaku (黄檗), which arrived in Japan in the 17th century). Zen emphasizes personal and direct insight as the road to enlightenment, which is obtained via meditation, study, and interaction with teachers. Zuihitsu (随筆): A Japanese literary genre in which the author records their thoughts and musings, as well as personal experiences. It remains popular with classically-inclined writers. Famous historical examples include the Makura no Sōshi (Pillow Book of Sei Shōnagon), Hōjōki, and Tsurezuregusa. Hi Isaac, I have enjoyed your shows. I like how you tell the stories interjecting with your personal comments. The stories came to life. In fact, I started listened to a few of the thematic episodes and liked it so much that I decided to start from the beginning. :). I am on show #22. I have a question for you. I would like to learn Japanese both for causal conversations as well as potentially reading (mostly I am very into Japanese cuisine and would like to be able to read materials on that topic that might be more authentic beyond the ones that have been translated to English. I understand Chinese so I can kind of read between the characters to figure out the general gist. But I would really like to able read. I have tried learning from some online apps like HJ Lite and others. But I still struggle with it. As unlike English and other languages, I felt that I can learn some basic words then add on to them and start to pick up either the spoken or written language. That approach doesn’t seem to exist for Japanese. Any advices are welcome. Thank you! I feel like the best way to learn is to focus on learning sentences and phrases, not words. Honestly, I highly recommend the cool folks over at Manga Sensei; they might be helpful to you!